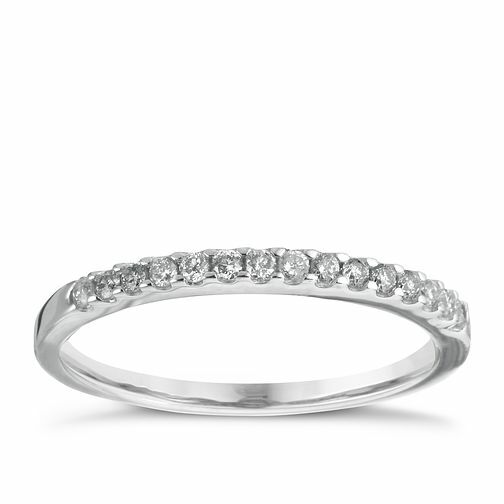 With a gentle indent in the centre of the ring that makes space to stack with an engagement ring, this beautiful wedding band features 0.15ct total of diamonds in a wishbone design for a delicate and sparkling token of your love. 18ct White Gold 0.15ct Wedding Band is rated 5.0 out of 5 by 6. Rated 5 out of 5 by Anonymous from Beautiful ring I've had mine 10 years this year. It's a beautiful, delicate ring. Just having a stone replaced at the moment after 10 years of constant wear. Rated 5 out of 5 by Anonymous from Great value for money, best price/quality I could find in the market I bought the band when there was a fabulous 20% off, it was already the best value ring I could in the market when compared like for like (it even had more diamonds than some) so this was a great find. I am so happy with my ring; the number of diamonds set in the band matches my engagement ring perfectly even though it is from another jewellers.